I do love my pizza oven. The oven goes up to 320°C which is great for pizza. 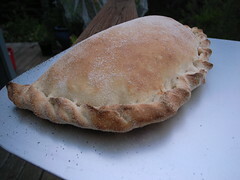 We have made Indian Naan bread, lots of pizza and calzone so far. 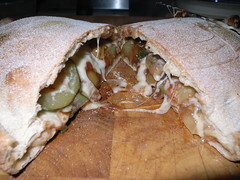 This calzone worked a treat with a ratatouille with mozzarella and fontina cheese. 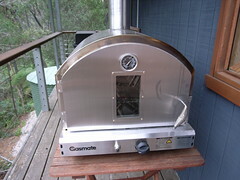 The oven is gas fired but comes with a smoke box which was great for pizza.